I'm here in Stevenson, WA at the Skamania Lodge where I will be doing a Social Media and Nonprofits Workshop for the grantees of the The Robert Wood Johnson Foundation Locals Initiative Funding Partners Program at their annual meeting. 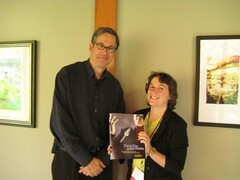 That's a photo of me with Andy Goodman at the break during the Keynote workshop on Story Telling as Best Practice. I had the opportunity to take a Webinar offer by NTEN just after his book, "When Bad Presentations Happen To Good Causes." (I referred to this book in one of my first screencasts in using flickr for presentations) What I learned deeply influenced and changed my practice in presenting. If you work for a nonprofit and you're not using story telling to share the impact of your programs, go buy Andy's book "Story Telling As A Best Practice." The techniques for telling a story can also be used on your blog. If I were starting a blog from a nonprofit organization, I would blog a story at least once a week. And, after a few months, think about the notebook you'd have to draw from when putting together a presentation. Huh. He's taller than I imagined. I'm a fan of Andy and his writing as well. Judging by your great smile, you are too!